Art as Science, 1988, Enamel on marinewood (120 x 162cms). This important little book or essay by Gombrich and Kris is relatively difficult to find as it has long been out of print. Because it is a fundamental source on the topic I have published this digital version for educational use only. Full text and all images are reproduced. Also, to facilitate citations, original page breaks noted in square brackets. THE blessed gift of laughter is one of mankind's prerogatives. We therefore need hardly consult archaeologists and historians to be certain that even in the ancient world men knew how to produce comic effects for each other's amusement. But though nearly every society known to us was acquainted with the comic, on the stage, in grotesque dances or in funny stories, far fewer of them knew comic pictures. "Pictorial art is much too sacred an activity to serve the purpose of exciting laughter." So may the grim, long-bearded Assyrian priest have spoken to the painter, and so indeed do no less grim academic critics still tell the public. Comic art is, and always has been, ranked as inferior. But the reasons for this low valuation have varied: sometimes it was reproached for lack of content; sometimes it was considered incompatible with the "grand manner" proper to the dignity of an artist; to-day it is reproached for having any content at all, because a picture which tells a story is thought to be inferior to one which embodies the true artist's " pure vision." Comic art, however, could always console itself for its [p. 4] position as Cinderella with the knowledge that, disregarded by the dogmatic and loved by the public, it enjoyed a freedom denied to great art. No one complained to the humorist who drew a bulb-like face with an enormous nose: " But, my dear chap, are you blind? Faces don't look like that. Did you ever see such a nose?" Everyone smiled and understood, because he was fully aware that that was all that was expected of him. But if the comic artist has the great advantage of being readily understood by his contemporary public, he pays for it by being more difficult of appreciation for the generations to come. It is difficult for us even to smile at humour which perhaps made our parents roar with laughter. It is still more difficult to decide definitely whether something which is separated from us by thousands of years was meant in fun or quite in earnest. The well-known humorous Chinese or Japanese figures of smiling, fat old men were not meant to be funny in the way that comic seaside postcards are to- day, but they [p. 5] were intended as talismans for luck and prosperity (Fig. 1). Who knows how often similar strange meanings lie hidden in bygone works of art which simply appear comic to us? Luckily, the historian is not always left in the dark about the past. In illustrations the meaning is usually obvious. The animals behaving like men in Egyptian papyri were no doubt comic, for in all probability they illustrate a book of fables, perhaps a kind of Egyptian Aesop (Pl. I). But such efforts at comic illustration are still widely different from what we call caricature. Greek art, of which many of us are accustomed to think as a stronghold of the grand and sublime, went a step further. The comic dramatists of Greece had invented a kind of entertainment whose influence is still alive to- day. In their comedies and satyric drama they travestied the old and familiar myths of the heroic deeds of gods and kings in trivial escapades of vulgar comic types. These comedies became so popular that they were often illustrated in vase paintings, and we see, for instance, Odysseus or Heracles as ridiculous oafs whose exaggerated ugliness mocks their fame as heroes (Pl. II.). It is the same contrast between the irreconcilable poles of crude reality and lofty idealism which has ever since then provoked universal laughter, for we all feel relieved once in a while to see the sublime reduced to the ridiculous. Travesties of this kind, which tear the mask from the pretensions of mankind's ideals, have kept their public throughout the ages. Apart from these travesties the comic type in early days wits always a poor and even a despised creature, one who had nothing to---lose but much to gain by his wit-a servant or a slave, a cripple or an outcast (Fig. 2). Whoever wishes to observe how deep-rooted and well-established the power and authority of the upper class always was in remote centuries need only consider this strange fact. Only the "people" were allowed to be seen from their funny side, only the humble could be represented in all [p. 6] their human weakness and animality. It was long before humour and public laughter dared to touch the mighty, at least in pictorial art. Classical art has preserved innumerable comic types of old slaves and, amusing parasites, but not a single caricature of an individual. To distort the image of an individual was, as it were, taboo; the comic might not intrude on civic dignity. The new conception of art fostered by the medieval church brought little immediate change in the status of comic art. The comic was for the most part still a realm outside the sphere of art whose function was to teach the layman the sacred word. But if the portals of cathedrals were adorned with solemn statues and the windows glowed with tragic martyrdoms, on stalls and capitals, in ornaments and gargoyles, the world of grotesque drollery lived its own life. In manuscripts even of the most sacred texts the margins were adorned with a fantastic wealth of dancing animals and strange monsters (Pl. III.). What prompted the artists to portray these bizarre figures? Was it a belief in some magic power to ward off the evil spirit, or just an innocent desire to indulge their sense of fun? Are the weird gargoyles awesome spells or merely facetious inventions? Perhaps one alternative does not exclude the other. Our mind is not divided into watertight compartments. Whoever has watched the audience of a gruesome thriller oscillating between horror and explosive laughter will have realised how close the uncanny and the comic can border on each other. Psychology shows us that they are, in fact, more nearly [p. 7] related than we might have suspected. What once impressed the child as uncanny and dangerous may become its favourite funny toy, and in all of us laughter may frequently result from overcoming unconscious fear. The history of mankind abounds in similar examples. The very Devil was made to play the comic fool in [p. 8] medieval plays. It is in this light that we see the medieval grotesque : on its way through the centuries, the terrifying monster may acquire the happy grin of humour. Fig. 3. The Doctor. German Woodcut, XVth Cent. Yet quite apart from such creations as these, medieval art knew how to use laughter to enforce a moral lesson. Comic distortion was used in the portrayal of sinners, and soon satirised types, like the dandy in the Dance of Death, the miser or the braggart in later medieval art correspond to some extent to the social types of modern satirical drawings. When realistic art was fully developed in the Renaissance no limit was set to the exaggeration of these types, and they developed into monsters of comic ugliness. German woodcuts, like that of the doctor whose body is shaped like his urine glass (Fig. 3), are very close to the satire of Rabelais, not only in spirit but also in time. And Pieter Brueghel made of his peasant scenes a veritable comédie humaine (Pl. IV.). The Pope's resemblance in th' infernal face. But the average broadside produced for political propaganda appealed to even more primitive strata in the human mentality. It was content to pillory the opponent by showing him hanging on the gallows. It hanged him in effigy. In times of political violence and mass excitement this primitive custom, which once even played a part in judicial proceedings, crops up again. Its aim is perhaps nearer, as one would assume at first sight, to black magic, where the destroying of a dummy which stands for the enemy is one of the most usual practices. Yet there is hardly a doubt that a public accustomed to strong meat laughed at such things, even as it laughed at the sight of humiliating cruelties of corporal punishment being [p. 10] inflicted on its enemies. In more than one sense the history of laughter is the history of human civilisation and education. It is therefore not of small importance to note the date when this world of clowneries and abuse gave place to portrait-caricature in the modern sense, which means the comic distortion of an individual. Leonardo da Vinci (1452-1519) is sometimes mentioned as one of its first exponents, but a closer examination of the grotesque heads which he liked to draw shows that they are rather an artist's experiment in various forms of ugliness and expression than portraits of individuals (Fig, 5. Surprising as it seems, we have no evidence of portrait caricature before about 1600. The artist who must be called the inventor of this joke of mock-portraiture would not readily be suspected of such an achievement. He is Annibale Carracci (1560-1609), known to connoisseurs as the restorer, of the "grand manner," the master of lofty compositions, the head of an academy, exponent of that rather smooth and conventional style better known through the works of his follower Guido Reni. Although this view by no means covers the whole of Carracci's activities, it must come as a surprise even to his admirers that the master of such sublime and classical pictures should at the same time have been responsible for the invention not only of the art but of the very word "caricature." Carraci himself is credited with a witty [p. 11] and clever defence of this activity of his. "Is not the caricaturist's task," he is reported to have said, "exactly the same as the classical artist's? Both see the lasting truth beneath the surface of mere outward appearance. Both try to help nature accomplish its plan. The one [p. 12] may strive to visualise the perfect form and to realise it in his work, the other to grasp the perfect deformity, and thus reveal the very essence of a personality. A good caricature, like every work of art, is more true to life than reality itself." Now, what was it that Carracci really wanted to express by his theories? Wherein lay the novelty of his achievement? It was in the first place a discovery concerning the nature of likeness. To put it briefly, it was the discovery that similarity is not essential to likeness. The deliberate distortion of single features is not incompatible with a striking likeness in the whole. True caricature in this new sense is not content with drawing a long nose just a little longer, or a broad chin just a bit broader. Such partial distortions are characteristic only of superficial or immature work. The real aim of the true caricaturist is to transform the whole man into a completely new and ridiculous figure which nevertheless resembles the original in a striking and surprising way (Fig. 6). Carracci is said to have portrayed his friends and fellow creatures as animals and we -all know modern examples of this kind (see Fig. 17). In drawings like these the artist changes every feature, every single part of the face. All he retains is the striking and individual expression which remains unaltered even when it is transferred to another creature. To recognise such similarity in different shapes, suddenly to find the image of a friend or an opponent in a drawing representing a dog or a parrot gives us all a shock of surprise to which we respond with laughter (cf. Pl. X). The faculty most essential to the caricaturist in this new sense is therefore a deep knowledge of the sources of expression such as will enable him to build up a life-like face out of a few strokes. This ability to see into the secrets of the human face in repose and in action developed very rapidly among the artists of the seventeenth century. Flemish and Dutch genre painters like A. Brouwer excelled in the rendering of fleeting expressions (Pl. V) ; and in [p. 13] Italy, Bernini (1598-1680), the great and famous Roman architect and sculptor, developed a virtuosity in this power which enabled him to render the characteristic satisfied grin of a cardinal in a single stroke (Fig. 7). A caricature reveals its true sense to us only if we can compare it with the sitter, and thus appreciate the witty play of "like in unlike." If we ascribed the discovery of this art to the seventeenth century we must now limit this statement. It was an innovation at that time only in the realm of pictorial art; in every other sense it already belonged to mankind. 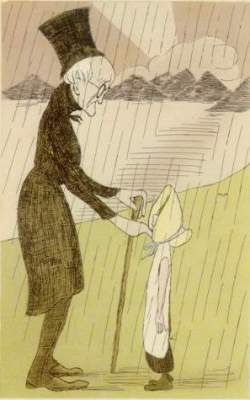 The schoolboy may always have "caricatured" his teacher in gestures and words: the clown may always have mocked the mighty by mimicry; or the servant may have copied in the kitchen, amid roars of laughter,his master's way of scolding, of taking off his spectacles or wrinkling his brow. And the comic effect was achieved by the incongruity of the little boy mimicking his master, or the pretty girl aping her gruff employer. If we ask the psychologist he tells us again that, as with caricature, the hidden and unconscious aim of such fun is connected with magic. To copy a person, to mimic his behaviour, means to annihilate his individuality. The very word. "in-dividual" means inseparable. If we succeed in singling out and imitating a man's expression or way of walking, we have destroyed this individuality. It is as if we declared to our laughing fellow-creatures. [p. 15] "Look, here is his whole secret. You need not be afraid nor even impressed; it is all a hollow sham." In acknowledging this similarity between caricature in life and in art the psychologist may wonder why it only made its appearance in art at so comparatively late a date. The answer which we put forward will certainly not convince everyone immediately. We think that portrait caricature was not practised earlier because of the dire power it was felt to possess; out of unconscious fear of its effect. Before caricature as an art could be born, mankind had to become mentally free enough to accept this distortion of an image as an artistic achievement and not as a dangerous practice. And in addition the artist had to learn, as he only began to do at the end of the Italian Renaissance, that he was not nature's servant but her master, that in painting an individual he was under no necessity to produce an exact likeness, but was free to express his personal vision of the sitter's essential characteristics. But even so it was a long time before caricature became what we mean by it, because the Italian caricature of the seventeenth century was a pastime for leisure hours only. The victims of such caricatures were not public heroes but friends of the studio, dilettanti and noblemen, enlightened enough to be flattered by these fruits of passing whim and gentle mockery. In the early years of the eighteenth century an Italian artist, P. L. Ghezzi (1674-1755) even made a living out of clever but unaggressive portrait-caricatures (Fig. 8). It was he who made this art popular through innumerable sketches and drawings of the populous world of amateurs and art-lovers in the Rome of his time. His works were collected and etched and even Sir Joshua Reynolds in his youth adopted his manner in several amusing pictures representing groups of his friends (PI. VI). The development of caricature in the eighteenth Century, however, was not due, to his influence alone. The soil was already prepared for this seed, and nowhere as well as in [p. 16] England. The tone of political propaganda pictures had somewhat changed since the days of the Reformation. Not that coarseness and abuse were altogether abandoned, but Dutch and English broadsides had discovered the power of laughter. They abounded in puns and humorous allusions. Thus Louis XIV appears in an etching by Romeyn de Hooghe (1645-1708) as driving on the sun god's chariot through the Zodiac (Fig. 9). One of his court painters at Versailles might have represented the "Roi Soleil" in such a pose. The pamphlet unmasks and ridicules the pretence of this current adulation. Tired and worn out, he stands on crutches in the broken chariot driven by his aged mistress, the "evening star," Madame de Maintenon. The Lion and the Unicorn wait for him as for their certain prey. It is the type of political allegory still universally adopted in cartooning. Caricature it is not: no distortion of the king's likeness is aimed at. And this kind of satire was still outside the sphere of recognised art. It was William Hogarth who, by his vital spirit, ennobled this journalistic work and made it a genuine expression of the age. Before Hogarth all barriers fell. For him not only the outcast, the low and the servile were funny, but every fool whatever his social position might be. In his famous series like The Rake's Progress or The Four Stages of Cruelty, he takes up the tradition of instructive moral pictures which the later Middle Ages had cultivated and which lived on in popular art-but he takes it up in a new spirit. All the artistic means acquired by Dutch genre art were at his disposal and helped him to express his surprising knowledge of the human heart, human behaviour and human expression. According to Hogarth's own writings, the figures in his pictures are actors who are meant to express in their outward appearance the parts they have to play. He peoples his stage with human nature in paint (Pl. VII). He openly declared that this had nothing to do with [p. 18] "that modern fashion, caricature," because his intention was not to make witty comparisons of things apparently unlike, but to reveal the character through the face. Yet his way of seeing life gave caricature a new impulse. When caricature came to England it was a more or less sophisticated joke, as Hogarth himself described it. When it left England to conquer the world, it had developed not only into a branch of art, but also into a weapon. It would be worth while to consider the part played by amateur artists in this development. George, Marquess of Townshend, later Lord Lieutenant of Ireland (1724 - 1807), was, according to Walpole, the first to apply portrait caricature to politics. His crude but extremely witty cartoons were acclaimed by an eager public (Fig. 10). In the sixties and seventies of the eighteenth century it became a fashion almost amounting to a craze in society to draw caricatures and funny scenes. The reason for this predilection is obvious: in so far as caricature is a graphic joke, it no more requires a painter's gift than a skilled punner must be a poet. Indeed, the drawings of the late eighteenth century amateurs were often even funnier when produced by untalented but witty persons, because intentional and unintentional humour both occurred in their productions. The professional artist soon learnt to, adopt this effect, to [p. 19] renounce "design" and to be deliberately crude. This is very generally true of the immense mass of broadsides published between 1780 and 1820. whose greatest master was unquestionably James Gillray. Gillray did not by any means renounce the older and more primitive effects obtained by emblematical allusions, inserted labels, and even of crude and simple abuse, but in his cartoons portrait caricature played an integral part. True, these caricatures are no longer the result of spirited interplay of like and unlike. Just as modern cartoonists do, he succeeded in reducing the protagonists of the political stage to simple formulae. He and his followers never tired of repeating his impressive "grammalogues"-Pitt's angular rosy face (Pl. VIII, IX), Fox's broad sensual lips and steep dark brow, "Boney's" pale, dwarfish complexion-to hammer them into the mind of the public. And even now no student of the period can quite escape from them. The art of cartooning is thus very much indebted to Gillray's mighty impulse which has made itself felt right up to our own day. 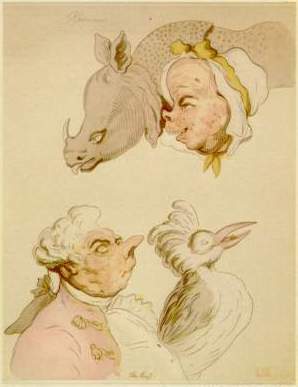 In a very similar way humorous illustration owes much of its angle of vision and of its approach to life to the art of Thomas Rowlandson. In following the Hogarthian tradition of social, satire rather than of political propaganda, he looked at the varieties of mankind to unveil weakness wherever he met with it. Before his pitiless eye the screen of "manners," education and civilisation dwindled, and behind it appeared the everlasting impulses of desire, the animal in man (Pl. X, XI). It was in Gillray's and Rowlandson's time that their prints and similar products began to be called "caricatures," and this extension of the original meaning, by which the term was confined to portrait caricatures, was justified up to a point. Aims and means were the same in both types-to ridicule and castigate by means of light-hearted playful distortion. The range of caricature has remained the same until to-day. But since then it has achieved a definite place in the social world, and this it [p. 20] first found in France. Charles Philipon (1806-1862) was the first to start, in the year 1830, a comic weekly, La Caricature, and this was soon followed by his daily, Charivart. These are the ancestors of innumerable comic papers all over the world. 0ne of Philipon's jokes has become world-famous. In a libel action brought against him for having drawn Louis Philippe, the hated Roi bourgeois as a "poire " (implying that he not only looked like a pear but was a fathead, the other meaning of the word), Philipon defended himself in court by showing how naturally and almost inevitably the King's portrait merged into this incriminating symbol (Fig. 11). Condemned to pay 6,000 francs, his paper published the text of the verdict, as the law demanded, on the front page -but in the form of a pear. Thus a play on words and a [p. 21] visual joke were happily combined: a combination which is still from time to time achieved in the comic drawings of the best and wittiest caricaturists. It may therefore be worth while to halt for a moment and look at Philipon's joke from the psychologist's point of view, for in it he succeeded in unfolding, as in a slow-motion picture, the process which goes on in the caricaturist's mind. In an aggressive mood the vague idea that the reactionary was really a "fathead," a "poire," gained visual shape. As if in a dream the king's features faded out, and merged, as [p. 22] it were, in the shape of a pear. He looked what he was. Philipon arrives at a picture which is both a king and apoire, a likeness and a libel -- a caricature. Fig. 12 "After you, please"
Philipon's most outstanding gift was the discovery of talent. There is hardly one among the great caricaturists of France, Daumier, Gavarni, Grandville, Doré, whom he did not employ at least temporarily. The greatest of them all, Daumier, worked for him all his life, producing more than 4,000 lithographs (Fig. 12) ; and, according to his own confession, wishing every time he drew one that it should be his last. His art far transcends any such division as that of the ridiculous from the sublime: a drawing like his illustration to Moliére's Le Malade Imaginaire combines both at one and the same time (Pl. XIII). Daumier is too great an artist for his work to be called typical. More characteristic is that of Grandville, the virtuoso of the art of transformation, with his witty interplay of forms and meanings, so brilliantly exemplified in the cartoon in which the shadows of the various reactionary ministers reveal their inner nature (PI. XII). Yet it was at this time that the second great discovery of comic art was on its way: the evolution of a peculiarly humorous style of draughtsmanship. We have mentioned its roots in passing: the sketchy style of great masters like Bernini who dashed off their portrait caricatures in a few bold strokes (Fig. 7), and the unaccomplished scribbling of amateurs (Fig. 10). Opposed as these two sources seem, they have one common characteristic-both simplify the world and reduce its representation to an easy game. Comic art of the nineteenth century gradually learnt to exploit the effects obtainable by this simplicity, ranging from the brilliant childishness of Edward Lear's (1812-1888) or Thackeray's (1811-1863)-nonsense drawings (vignette, p. 4, Fig. 13), to the masterly simplifications of Phil May (1864-1903) (Fig. 14) or Wilhelm Busch (1832-1908) (Fig. 15). This same style forms an integral part of the comic effect achieved by caricaturists like T. T. Heine (Pl. XIV) or Max Beerbohm (Pl. XV). But its true field is the humorous picture story, initiated more than a hundred years ago by the Swiss R. Toepffer (1799 - 1844) (Fig. 16), and culminating, in the "comic strip which stands at the cradle of the one peaceful conqueror of the modern world, Mickey Mouse (Pl. XVI). Thus while the position of serious art becomes more problematic every day- caricature has given birth to a new form of art, bristling with undreamed-of potentialities. Nor has caricature proper failed to keep the place [p.26] which it won during the last three centuries. The most serious question facing the modern artist-that of his contact with the rest of the world seems not to arise for the caricaturist. Great caricaturists like David Low (b. 1891) (Fig. 17) do succeed in communicating their ideas to the public. We have all become accustomed to await eagerly their latest comment on the affairs of the day. There are hopes, moreover, that caricature will remain a living art as long as civilisation persists, because it meets an urge which is bound up with the very achievement of civilisation. Civilisation has taught us to renounce cruelty and aggression which once ran riot in atrocious reality and magical practices.There Was a time in all our lives when we enjoyed being rude and naughty, but education has succeeded-or should have succeeded-in turning this joy into abhorrence. We do not let ourselves relapse into that state again. and if ever such impulses break loose under the influence of passion, we feel embarrassed and ashamed. In caricature, however, these forces find a well-guarded playground of their own. The caricaturist knows how to give them scope without allowing them to get out of control. His artistic mastery is, as it were, an assurance that all we enjoy is but a game. In this sphere, the sphere of artistic freedom, we are allowed to indulge our impulses free from fear. Willingly we may yield to the caricaturist's temptation to us to share his aggressive impulses, to see the world with him, distorted. Sometimes we may revolt with him against a political leader, an institution or a social type, sometimes against the very objects of our admiration, the claims of sense and reason whose unchallengeable respectability weighs heavily on our minds. What Freud has taught us about Wit and its relation to the unconscious applies no less to the graphic expression of Wit. For a short respite we cast off the bridles which restrain our aggressive impulses and prescribe the strict path of logic to our thought. With the caricaturist we may relapse into a stratum of the mind [p. 27] where words and pictures, rules and values lose their well established meaning, where the king may be changed into a pear and a face into a simple ball. And thus we are led back on a lightning excursion to the sphere of childhood, where our freedom was unhampered. In the eternal child in all of us lie the true roots of caricature. From the enormous bulk of literature on the subject the following might be quoted: C. R. Ashbee, Caricature, London, 1928. R. Davis, Caricature of To-day, Special Number of "The Studio," 1928. D. Low, Ye Madde Designer, London, 1935. B. Lynch, A History of Caricature, London, 1926. T. Wright, A History of Caricature, London, 1865. The many works by Champfleury, Grand Carteret, E. Fuchs contain much valuable material. An indispensable help for any future history of English Caricature is the Catalogue of Prints and Drawings in the British Museum, Division 1, Political and Personal Satires, especially the last volumes, by D. M. George (in progress). For the psychological approach to the subject see S. Freud, Wit and its relation to the unconscious (translated by -X. A. Brill) London, 1916. E. Kris, The psychology of Caricature, International Journal of Psycho -Analysis, XVIL, 1936. E. Kris and E. Gombrich, The principles of Caricature, The British Journal of Medical Psychology, Vol. XVI 1, 1938. I. 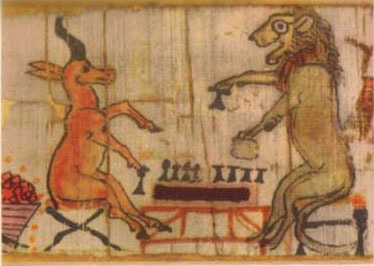 THE LION AND THE ANTELOPE PLAYING DRAUGHTS. Egyptian Papyrus, c. 1000 B.C. By courtesy of the Trustees of the British Museum. Our interpretation is not wholly unchallenged. These pictures have been called " parodies " of tomb paintings and even interpreted as political cartoons (Olivier Beauregard, La Caricature Egyptienne, Paris, 1894). II. ODYSSEUS AND DIOMEDES STEALING THE PALLADIUM (THE IDOL OF ATHENE, SAFEGUARDING TROY). Vase painting of the 4th century B.C. For the history of this kind of South Italian farce (Phlyakes) compare M. Bieher, The History of Greek and Roman Theater, Princeton-London, 1939. III. MARGINAL DROLERIE FROM A PSALTER MANUSCRIPT. IV. Pieter Brueghel the Elder (1525-1569). HEAD OF A DANCING PEASANT. From the painting The Kermess, in the Kunsthistorisches Museum, Vienna. By courtesy of the Staatsdruckerei, Vienna. By courtesy of Die Piperdritclce Verlags-6.m.b.H.. Munich. VI. Sir Joshua Reynolds (1723-1792). CARICATURE GROUP. John Woodyeare, his tutor, the Rev. Dr. Drake, Mr. Crooke and Sir Charles Turner. VII. William Hogarth (1697-1764) A FRENCH MONK ADMIRING ENGLISH BEEF. Detail from the painting The Gate of Calais. By courtesy of the Trustees of the National Gallery. Occasioned by a debate on March 6th, 1805, on the " Additional Force Bill ". Pitt, then Prime Minister had answered the attack of his old opponent Sheridan with unusual personal bitterness, ".......all his hoarded repartees, all his matured jests, the full contents of his commonplace book ... he kindles into a blaze of eloquence, and out it comes altogether, whether it has any relation to the subject in debate or not." On the desk other bottles such as Fox, " French wine," wait to disgorge their contents. IX. Anonymous follower of J. Gillray. JOHN BULL AT HIS STUDIES ATTENDED BY HIS GUARDIAN ANGELL. X. Thomas Rowlandson (1756-1827). PHYSIOGNOMICAL STUDY. Water-colour. By courtesy of the owner, Sir Robert C. Witt, C.B.E. ﻿The comparison of human and animal physiognomies was rooted in a widespread physiognomicaI doctrine, ascribed to the authority of Aristotle. Since it had been illustrated in a book on the subject by G. B. Porta (1586), it had frequently been exploited by caricaturists, and there are actual copies by Rowlandson of Porta's illustrations extant. XI. Thomas Rowlandson. HEAD OF AN OLD JUDGE. Water-colour. By courtesy of the owner, A. P. Oppe, Esq. For Rowlandson's water colours compare A. P. Oppe, Rowlandson, The Water Colourist, London, 1924. XII. Grandville (pseud. for J. I. Gérard) (1803-1847). THE SHADOWS (Les Ombres Portées). From La Caricature, 18th Nov., 1830. XIII. Honoré Daumier (1810-1879). 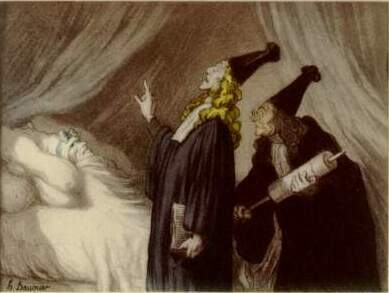 ILLUSTRATION TO MOLIÉRE'S COMEDY, LE MALADE IMAGINAIRE. (Les Ombres Portées). From La Caricature, 18th Nov., 1830. By courtesy of the Home House Trustees (Courtauld Institute of Art). XIV. Thomas T. Heine (b. 1867). THE LIBERTY OF SCIENCE. From Der Simplicissimus, Year 5, No. 5 (1900). One of the humorous series Through Darkest Germany, meant. at that time, as burlesque exaggeration. XV. Sir Max Beerbohm (b. 1872). WILLIAM WORDSWORTH IN THE LAKE DISTRICT, AT CROSS-PURPOSES. From Poets' Corner, London, 1904. By courtesy of the artist. XVI. Walt Disney (b. 1901). "RIDE 'EM, COWBOY!" From the Silly Symphony Mickey's Polo Team (1936). By courtesy of Walt Disney Mickey Mouse Ltd.
© 2001 Ross Woodrow - copyright is strictly reserved to educational, non-commercial use.